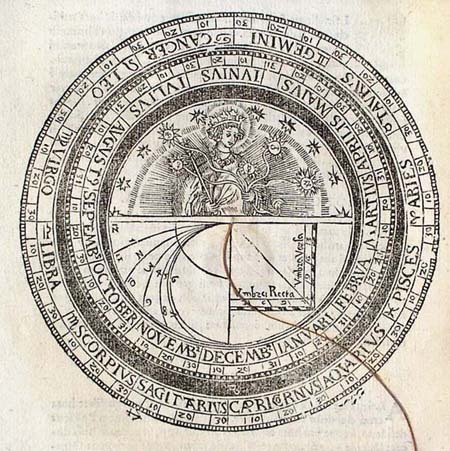 One of the full page illustrations in Cosmographia is this circular calendar. The outer scale shows the Zodiac, each sign divided into 30 degrees. The lower left quadrant of the inner disc can be used to tell the time in unequal hours, which were widely used in the 16th century. Because unequal hours divided both day and night into twelve hours each, these hours varied in length with the seasons, as do day and night. The right quadrant shows a shadow square, a proportional measuring device often used to measure heights at a distance.